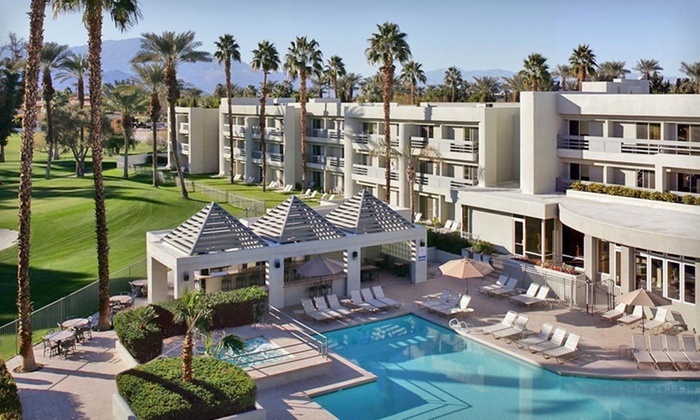 Modeled after European-style boutique hotels, the intimate, luxurious Indian Wells Resort Hotel, located just minutes from Palm Springs, was built by Hollywood legends Lucille Ball and Desi Arnaz as an exclusive desert getaway. The Indian Wells Country Club golf course - the original home of the Bob Hope Chrysler Classic, and now currently the course for the annual Frank Sinatra Countrywide Celebrity Invitational. Whether it's for business or pleasure, a week or a day, you will surely enjoy your stay at this historic "Gem of the Desert." Amenities include continental breakfast buffet, personal data-ports, lodgenet entertainment system, iron and ironing boards, private wall safes, minibar, robes, vanity mirrors, hairdryers, poolside dining, lounge with live entertainment, dancing and televised sports.